The Panasonic wet/dry epilator gives you silky-smooth results that last up to four weeks. Use it in the bath with lather for a refreshing, regenerating experience, or use it dry wherever, whenever. The epilator also comes with a convenient traveling pouch so you can enjoy it both at home and on the go. Performs with less pain and irritation by holding down the skin and removing hair from the root. The 36 tweezing discs do not come into contact with the skin, so your skin is protected from cuts and abrasions. The pivoting head's side-to-side gliding motion treats skin softly, gently removing hair from the root. 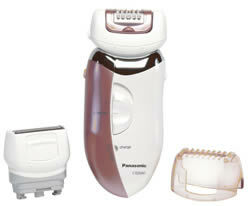 The wet/dry epilator also features a shaver and bikini trimmer, giving you an all-in-one hair-removal package. Changing shaver options is easy  just snap off the epilator and attach the shaver head. The bikini trimmer is located on the shaver, so press an easy and convenient slider and the trimmer pops right up. The shaver is also equipped with razor-sharp stainless steel blades, so you get smooth results every time. Since our epilator is rechargeable you are free to epilate where it is most convenient without the hassle of being connected to an outlet. Full charge allows 30-minutes of comfortable cordless useage. This page is part of GeneralManual.Com Network Panasonic ES2045D/ES2045P Women's Shavers and Epilators User Manual.